Researchers from the University of Aberdeen are developing a computer system - known as BabyTalk - that can generate easy to understand reports on the medical condition of babies in neonatal care. These reports are updated every 24 hours and made available online to the infant’s parents, providing a simple summary of their child’s progress. The computer system can also send automatic updates to concerned family and friends on behalf of the parents, allowing them to share all or part of the summary of their baby’s condition. Researchers are looking for parents from the North East, of Scotland, Tayside and Fife that have had a baby in neonatal care in the last ten years to try out the system. Saad Mahamood from the University of Aberdeen’s Department of Computing – one of the researchers undertaking the study said: “When a baby is in a Neonatal Intensive Care or a Special Care Baby Unit it can be hard for parents to take in all of the complicated medical information and the treatment that their baby is being given. “When a baby is in a neonatal ward, their medical details and information on interaction with nurses or family members is recorded in a database by the hospital. “Babytalk takes the information produced by this database and creates a simple text version of what has happened to the baby within the last 24 hours. Volunteers in the study will be asked to look at a range of short text reports about babies in neonatal care. They will then be asked to discuss how they feel on reading those reports. They will also be asked to try out the automated system which sends messages to family and friends. Wendy Moncur, who is also part of the research team working on the study, has personal experience of having a sick newborn baby. 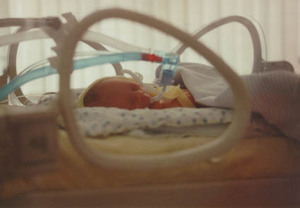 Her son James – now 11 years old – developed pneumonia soon after birth. Wendy’s personal experience is partly what motivated her to carry out research into using computers to help improve other parents’ experience of having a sick baby. Wendy said: “Very soon after James was born, he developed pneumonia. This led to him spending five days in a Special Care Baby Unit. I understand from first hand experience what a scary time it is when your child is in neonatal care. “My personal experience combined with my academic and occupational background – I am a computer scientist and I have also worked for the National Childbirth Trust as an antenatal teacher – has been incredibly useful in helping develop this new technology. “We are looking for volunteers who have had personal experience of a baby in neonatal care to try out our system. They don’t need to know anything about computers to take part. Volunteers can take part in the study from home or by visiting the University of Aberdeen. It should take no more than 40 minutes to take part, and no computer experience is required. Those wishing to volunteer from the Aberdeen city and shire area should contact Saad Mahamood on 01224 274173 or saad.mahamood@abdn.ac.uk. Those wishing to volunteer from the Tayside and Fife areas should contact Wendy Moncur on 01382 386538 or wmoncur@abdn.ac.uk.